Fall in love with this gorgeous Adrianna Papell gown. Figure-loving silhouette features a contemporary popover bodice. Gorgeous embroidery throughout a poly fabrication. V-neckline. Fixed spaghetti straps. Concealed zipper closure at back. Lined. Floor-sweeping straight hemline. 100 percent polyester Lining: 100 percent polyester. Dry clean only. Imported. Measurements: Length: 52 in Product measurements were taken using size 2. Please note that measurements may vary by size. 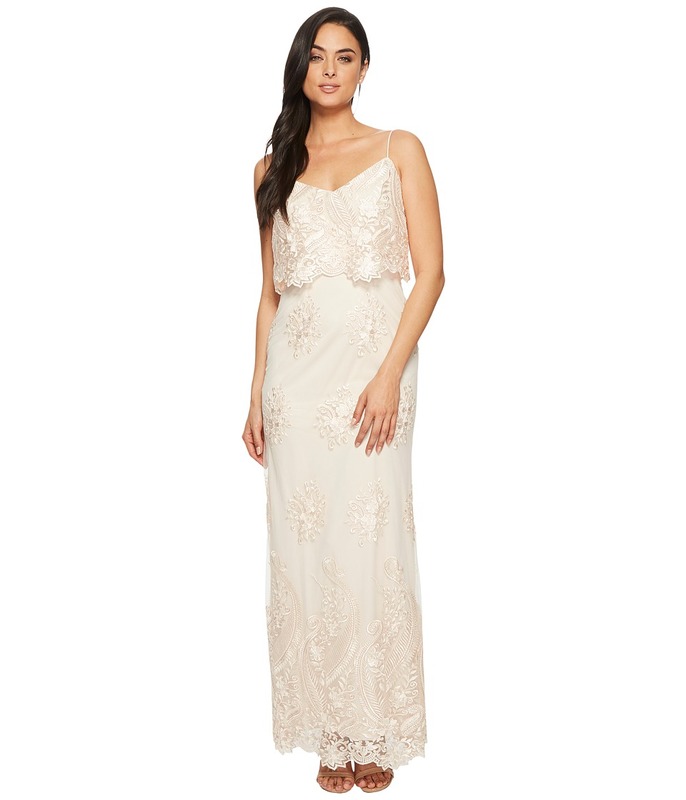 Create lasting memories in this stunning Adrianna Papell gown. Figure-loving silhouette. Gorgeous embroidery throughout a lightweight-poly fabrication. Halter neckline. Self-ties at nape. Sleeveless. Flirty cutout at back. Defined waist. Concealed zipper closure at back. Lined. Floor-sweeping straight hemline. Shell 1,2,3: 100 percent polyester Lining: 100 percent polyester. Dry clean only. Imported. Measurements: Length: 65 in Product measurements were taken using size 2. Please note that measurements may vary by size. A stunning Adrianna Papell gown for your special night. Ballgown silhouette. Beaded bodice complements the chiffon skirt. Sweetheart neckline. Fixed spaghetti straps. Soft cups for added support. Concealed zipper closure at back. Lined. Floor-sweeping straight hemline. 100 percent polyester Lining: 100 percent polyester. Spot clean only. Imported. Measurements: Length: 57 1 2 in Product measurements were taken using size 2. Please note that measurements may vary by size. Make lasting memories in this Adrianna Papell dress. Sheath silhouette features a contemporary popover bodice. Shimmering lace fabrication. Round neckline. Short sleeves. Concealed zipper closure at back. Lined. Straight hemline. 100 percent polyester Lining: 100 percent polyester. Dry clean only. Imported. Measurements: Length: 38 in Product measurements were taken using size 2. Please note that measurements may vary by size. 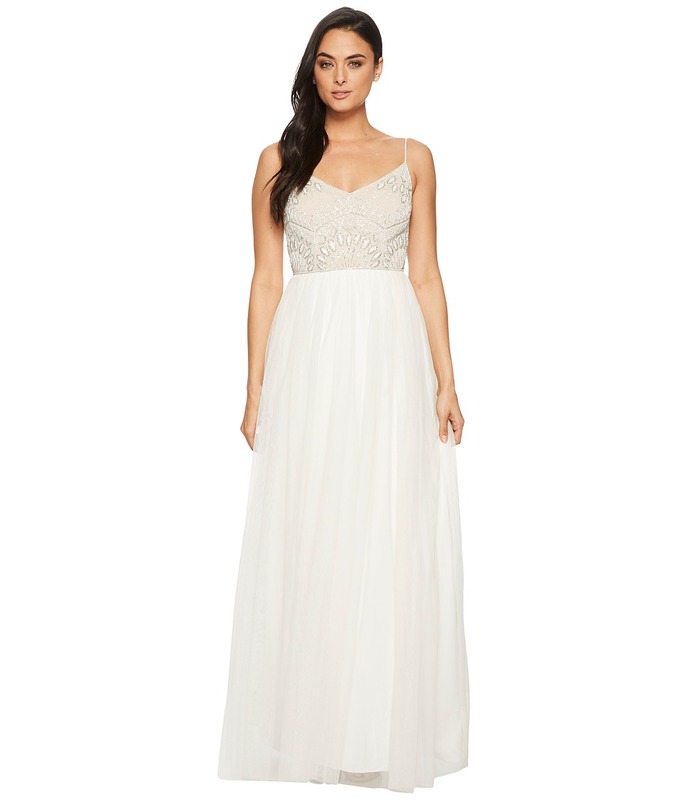 Stand out at your next event in this Adrianna Papell gown. Figure-loving sheath silhouette. Crepe fabrication features beaded embellishments throughout bodice. Round neckline. Sleeveless. Split zipper closure at back. Flirty cutouts at sides and back. Lined. Floor-sweeping straight hemline and back. Elegant back train. 95 percent polyester, 5 percent elastane Lining: 100 percent polyester. Spot clean only. Imported. Measurements: Length: 72 in Product measurements were taken using size 2. Please note that measurements may vary by size. Stand out at your next event in this Adrianna Papell Folded Puff Sleeve Scoop Neck Sheath. Short-sleeve dress in a sheath silhouette. Solid colorway on a stretch-poly fabrication. Scoop neckline. Folded, puff sleeves. Exposed zipper closure at back. Lined. Straight hemline. Back vent. 94 percent polyester, 6 percent spandex Lining: 100 percent polyester. Dry clean only. Imported. Measurements: Length: 40 in Product measurements were taken using size 2. Please note that measurements may vary by size. 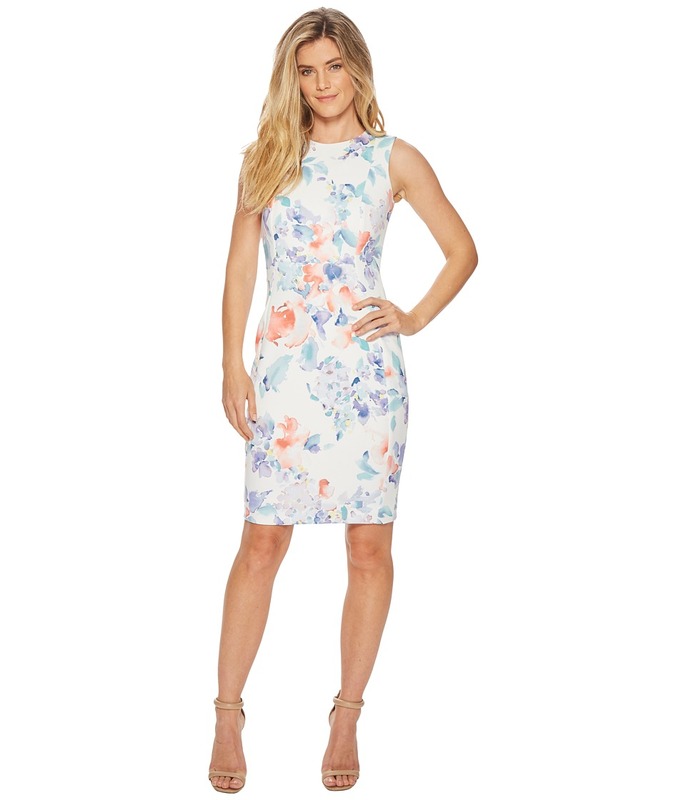 Stand out at your next event in this Adrianna Papell Floral Print Sheath. Sleeveless dress in a sheath silhouette. Floral design on a stretch-poly fabrication. Round neckline. Exposed zipper closure at back. Lined. Straight hemline. 92 percent polyester, 2 percent spandex Lining: 100 percent polyester. Dry clean only. Imported. Measurements: Length: 38 in Product measurements were taken using size 2. Please note that measurements may vary by size. Your style will be in full bloom in this Adrianna Papell dress. Sheath silhouette. Floral print throughout a stretchy-crepe fabrication. Draped cowl neckline and V-shaped back. Cap sleeves. Tucked detail throughout bodice. Lined. Straight hemline. 97 percent polyester, 3 percent elastane Lining: 100 percent polyester. Dry clean only. Imported. Measurements: Length: 40 in Product measurements were taken using size 2. Please note that measurements may vary by size. Fall in love with this Adrianna Papell dress. Sheath silhouette. Georgia lace fabrication. Bateau neckline. Elbow length sleeves. Satin trim at banded waist. Concealed zipper closure at back. Partially lined. Scalloped hemline. 70 percent nylon, 30 percent cotton Lining: 100 percent polyester. Dry clean only. Imported. Measurements: Length: 38 in Product measurements were taken using size 2. Please note that measurements may vary by size. Make lasting memories in this Adrianna Papell dress. Fit-and-flare silhouette. Gorgeous floral-lace fabrication. Round neckline. Short sleeves. Lattice trim at waist and bodice. Concealed zipper closure at back. Exposed contrast lining. Scalloped hemline. 85 percent nylon, 15 percent cotton Lining: 100 percent polyester. Dry clean only. Imported. Measurements: Length: 37 in Product measurements were taken using size 2. Please note that measurements may vary by size. 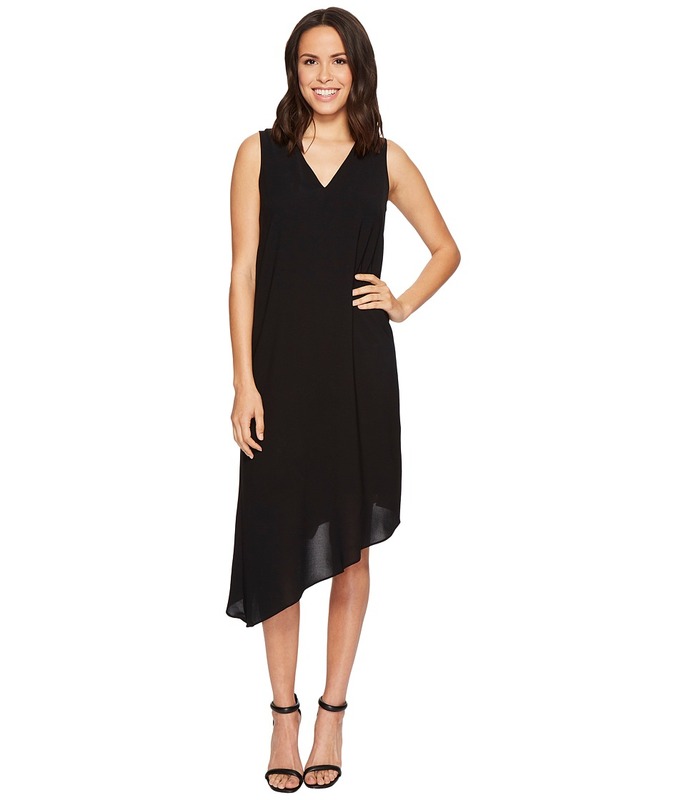 Go from office to happy hour in this sleek Adrianna Papell dress. Sheath silhouette. Solid colorway on a micro-ottoman fabrication. Round neckline. Short sleeves. Lace-up detail at sides of waist. Exposed zipper closure at back. Lined. Straight hemline. 100 percent polyester Lining: 100 percent polyester. Dry clean only. Imported. Measurements: Length: 36 in Product measurements were taken using size 2. Please note that measurements may vary by size. Take your style to the next level in this Adrianna Papell dress. Trapeze dress in a shift silhouette. V-neckline and back. Sleeveless. Draped ruffle detail at back. Lined. Asymmetrical hemline. 100 percent polyester Lining: 100 percent polyester. Dry clean only. Imported. Measurements: Length: 54 in Product measurements were taken using size 2. Please note that measurements may vary by size. Fall in love with this Adrianna Paprell dress. Sheath silhouette. Georgia lace fabrication. Round neckline. Sheer short sleeves. Concealed zipper closure at back. Exposed contrast lining. Scalloped hemline. 70 percent nylon, 30 percent cotton Shell 2: 100 percent polyester Lining: 100 percent polyester. Dry clean only. Imported. Measurements: Length: 38 in Product measurements were taken using size 2. Please note that measurements may vary by size. 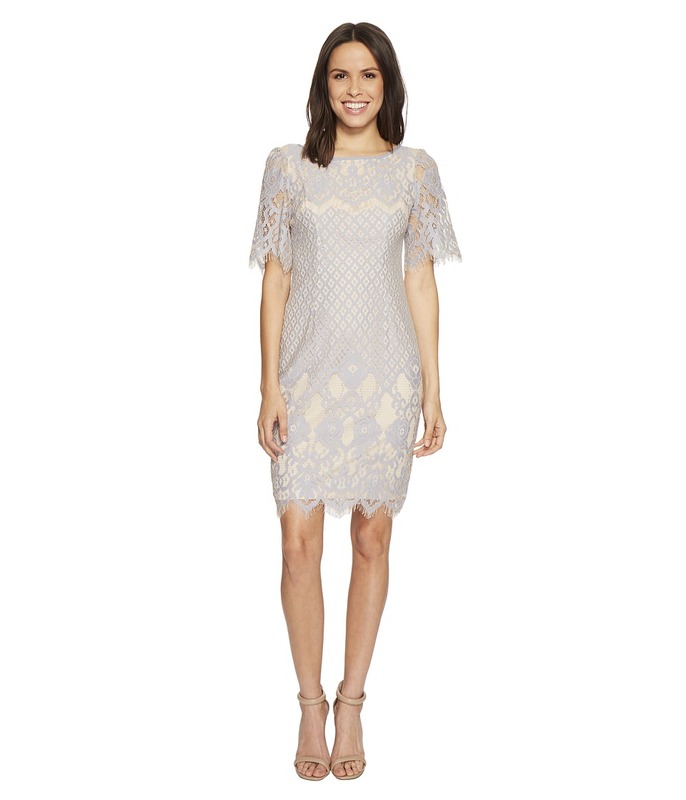 Go from office to happy hour in this Adrianna Papell dress. Trapeze dress in a shift silhouette. Round neckline. 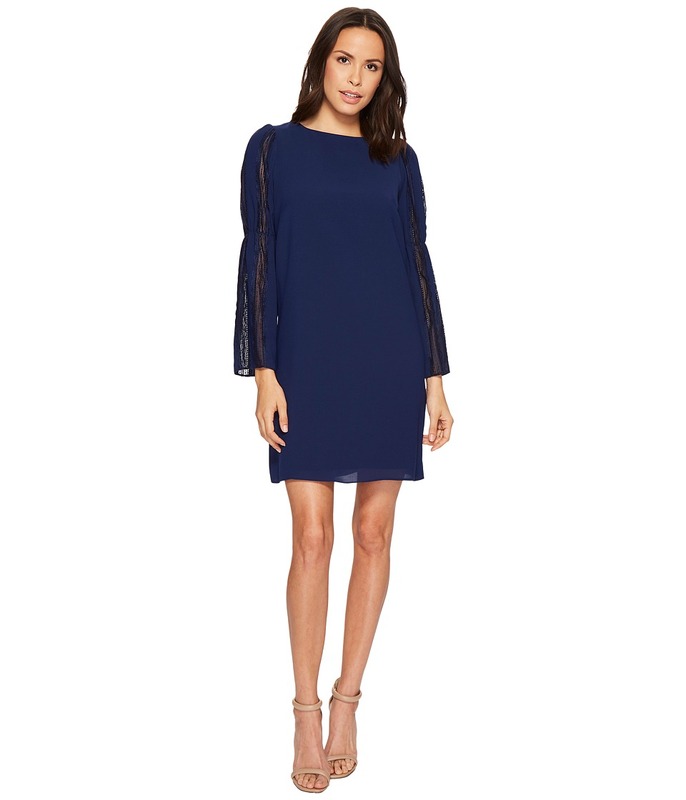 Long bell sleeves feature lace panels throughout. Concealed zipper closure at back. Lined. Straight hemline. 100 percent polyester Lining: 100 percent polyester. Dry clean only. Imported. Measurements: Length: 35 in Product measurements were taken using size 2. Please note that measurements may vary by size. Turn heads in this sleek Adrianna Papell dress. Sheath silhouette. Banded jersey-matte fabrication. Round neckline. Cap sleeves. Exposed zipper closure at back. Lined. Straight hemline. 96 percent polyester, 4 percent elastane Lining: 100 percent polyester. Dry clean only. Imported. Measurements: Length: 37 in Product measurements were taken using size 2. Please note that measurements may vary by size. 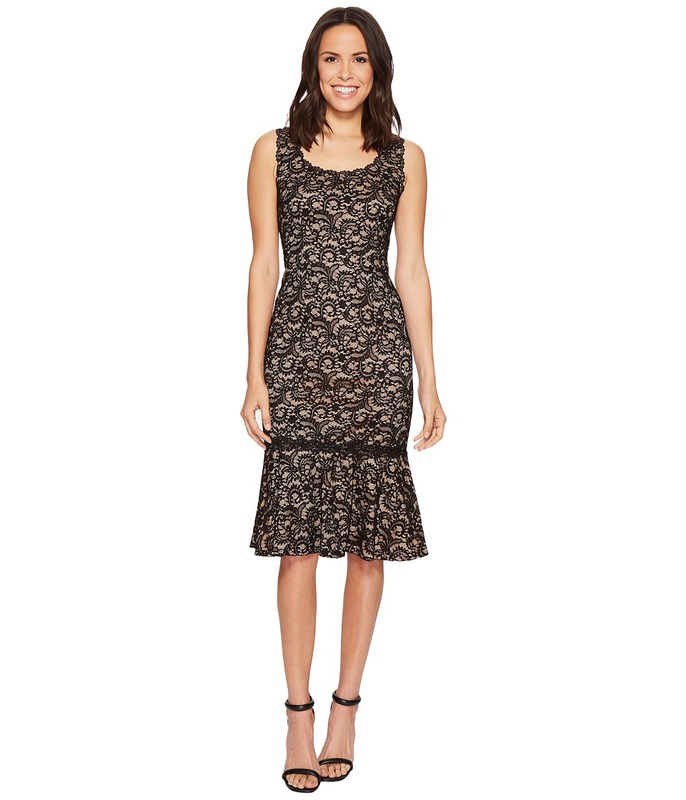 Go from office to happy hour in this Adrianna Papell dress. Sheath silhouette. Solid colorway on a crepe-knit fabrication. Round neckline. Cap sleeves. Concealed zipper closure at back. Lined. Straight hemline. Back vent. 95 percent polyester, 5 percent elastane Lining: 100 percent polyester. Dry clean only. Imported. Measurements: Length: 41 in Product measurements were taken using size 2. Please note that measurements may vary by size. 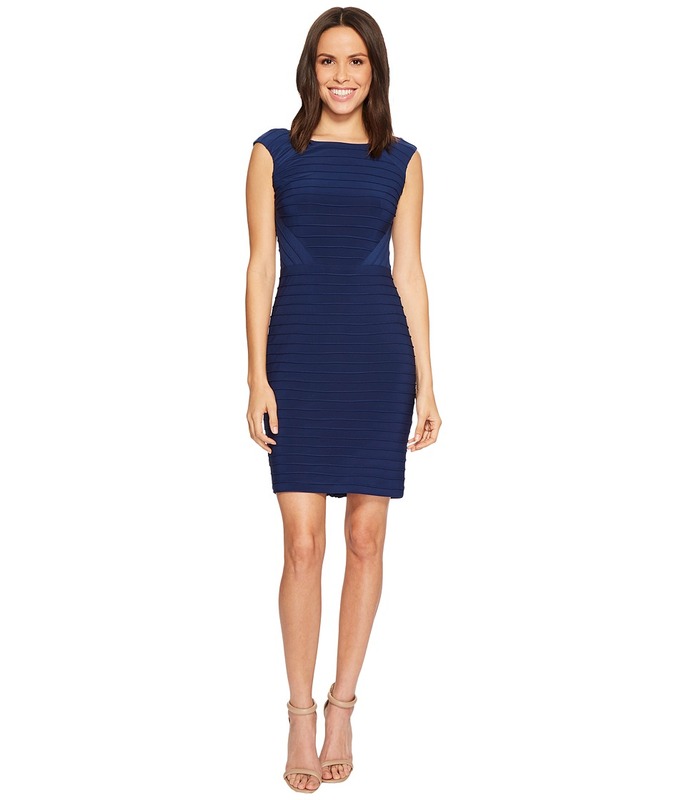 Go from office to happy hour in this Adrianna Papell dress. Shift silhouette. Solid colorway on a crepe fabrication. V-neckline. Button detail at short sleeves. Concealed hook and zipper closure at back. Lined. Straight hemline. 95 percent polyester, 5 percent elastane Lining: 100 percent polyester. Dry clean only. Imported. Measurements: Length: 34 in Product measurements were taken using size 2. Please note that measurements may vary by size. 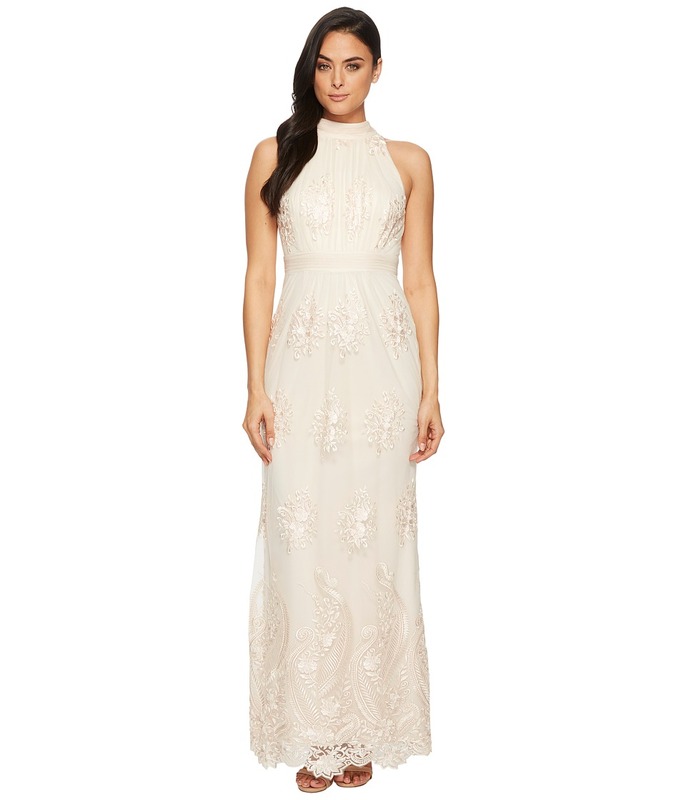 Turn heads in this Adrianna Papell dress. Sheath silhouette features a trumpet-style skirt. Two-tone lace fabrication. Scoop neckline. Sleeveless. Exposed zipper closure at back. Lined. Straight hemline. 59.8 percent nylon, 40.2 percent viscose Lining: 100 percent polyester. Dry clean only. Imported. Measurements: Length: 44 in Product measurements were taken using size 2. Please note that measurements may vary by size.